One of the things I love about summer cooking is its simplicity: Dead ripe summer produce and simply cooked, freshly caught fish. This red snapper recipe combines the two. And while this dish ain’t rocket science, there are a couple things that set it apart from your typical fish-with-seasonal-veggies recipe: The way I cook the fish and what I do with the tomatoes. 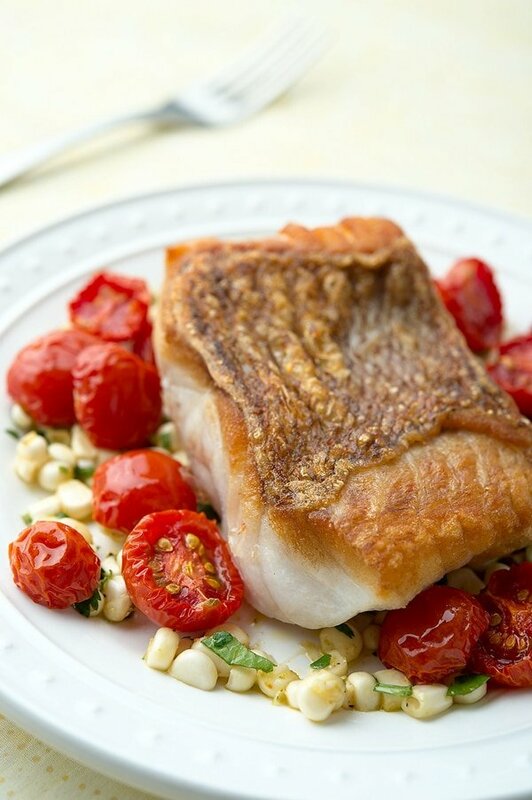 Before we start, know that you don’t need red snapper to make this recipe. Any firm, white fish works. Other snappers, black seabass, striped bass, Pacific rockfish or lingcod, smallmouth bass, walleye, grouper… you get the point. Now, the tomatoes. Of course you can just halve your cherry tomatoes and toss them in the pan for a few seconds, and yes, I do this myself sometimes. But I find that most cherry tomatoes are pretty watery, so I like to concentrate their flavor by slightly dehydrating them. I put the tomatoes in my dehydrator for a few hours to get them halfway there: Not hard, not even leathery, but definitely concentrated. You can do the same thing in a low oven, especially if you have a convection oven. It gives the dish a lot more punch to do this, if you have the time. Now as you can see, the red snapper a) has the skin on (although it contracted a lot when I cooked it! ), and b) is really only cooked on one side. That’s on purpose. 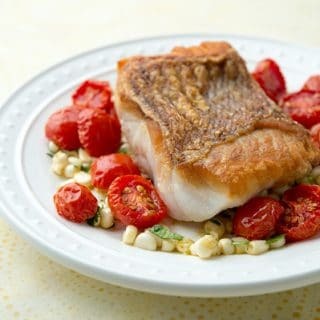 It’s a great way to cook any fish where you get that crispy side, whether it’s got skin or not — yep, you can do this with a skinless piece of fish — it’s easier to deal with because you are not flipping it, and you don’t overcook the inside of the fish because you are just basting the other side with the hot oil or butter. And yes, I prefer to use clarified butter when cooking fish, as it has a reasonably high smoke point and adds a ton of flavor. You can buy is as Indian ghee in the store, or you can make it yourself. Or just use oil. Finally, the herb element is also up to you. I like the combination of mint, corn and tomatoes, but parsley, cilantro, oregano, marjoram and chives will all work, and give you different results. Try this one next time you come home with some fish. And feel free to play with the recipe. After all, it’s summertime! The crux of this dish is fresh fish, cooked simply, with the freshest produce of summer. So if you don't have red snapper, use any lean, firm, white fish: Pacific rock cod, lingcod, redfish, walleye, smallmouth bass, black seabass, striped bass, big croakers, grouper, etc. And if you don't have or want to use red tomatoes, use any cherry tomatoes you want. Ditto with the corn. And honestly, if you want to just make this a lightning quick weeknight meal, skip the drying part on the cherry tomatoes and just toss them in at the last minute. Coat the halved cherry tomatoes in some oil and salt them well. Place them, cut side up, on a baking sheet and put in the oven at 200°F; no need to preheat. If you have a convection oven, turn the fan on. Or, you can put the tomatoes on a rack in your dehydrator and set it to 135°F. It will take longer for the tomatoes to get semi-dry, but it won't heat up your kitchen. Cook the tomatoes until they are about half dried, about 45 minutes to 1 hour in the oven, a bit longer in a dehydrator. Keep an eye on the tomatoes every 20 minutes or so, as different tomatoes and different ovens will give you different results. About 20 minutes before the tomatoes are ready, take the fish out of the fridge and salt it well. When the tomatoes are ready, heat the clarified butter in a large saute pan over high heat. As the butter is heating, pat the fish dry with paper towels. If you want a crispy skin, use a butter knife to scrape down the skin; this removes a but more moisture and results in a crispier skin. When the butter is hot, lat the fish skin side down in the pan, even if there is no skin; this side is flatter. Turn the heat down to medium-high and sear the fish well. As it cooks, use a spoon to baste the other side of the fish until it's just barely cooked: About 30 seconds of basting will do the trick. When the bottom of the fish is nicely browned, about 6 to 8 minutes, it should be ready. It should also lift up from the pan easily. Set the fish on a cutting board skin side up. Add the corn to the pan and toss to combine. Sprinkle it with salt. Add the tomatoes and the parsley and toss to combine. Cook for about 30 seconds and turn off the heat. Grind some black pepper over everything. 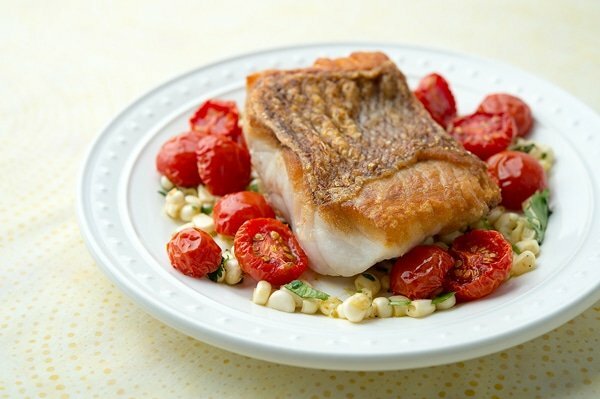 To serve, give everyone some of the corn-tomato mixture and set a piece of fish on top. 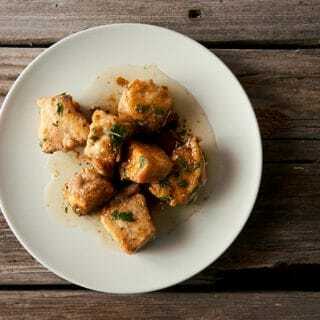 Serve with bread, potatoes or rice. You can find all sorts of recipes for all sorts of fish, right here on Hunter Angler Gardener Cook! Looks delicious, and the photos are absolutely stunning. I just want to confirm that the corn is raw when you serve it. Is that correct? I didn’t see any instructions on cooking it other than at the end, so I wanted to make sure. Thanks! Summer is really all about simplicity. This dish of yours says it all. It looks really amazing and definitely perfect as a summer dish. Another stunner. This is dinner tonight. Thanks, Hank!